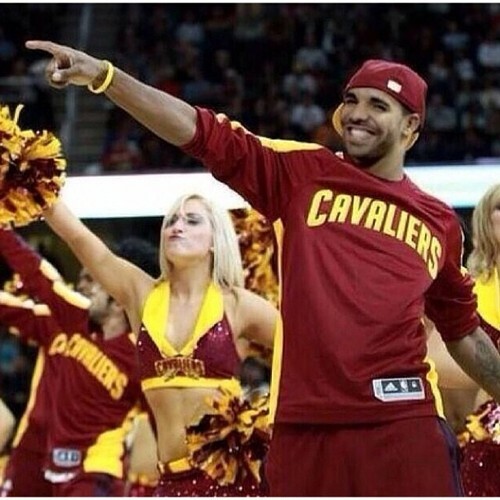 Drizzy proudly trades in his red and white of the Miami Heat for the burgundy and gold of the Cleveland Cavs. As spots open up for Cavaliers pre and post game entertainment, Drake is exercising all possibles “ins” into the Cavalier organization. Two weeks after LeBron James jostled the NBA East’s makeup by re-relocating back to Cleveland, a less publicized announcement happened that deserves some attention. Thanks to his well publicized affinity for hitching his wagon to the hottest teams/stars in popular sports, hip hop artist Drake decided that he, also, is heading to Cleveland. With his close “friendship” with both John Football as well as King James himself, Drake’s transition to a “lifelong Cleveland fan” shouldn’t surprise anyone. Drake’s flip-flopping allegiances puts him along side Manziel and James for the renewal of the Ohio economy as well as its’ sports fandom. “The weeks leading up to Bron’s decision was tough on Drizzy” says Patrick “P-Body” Benson. “Drizzy’s a Miami dude at heart, a Toronto hero at heart and a Cleveland lover at heart. Dude has a pretty big heart.” Although having Drake on the sideline provides the Cavs with no legitimate benefits, many Cleveland fans are rejoicing the new additions to famous Cleveland celebrities in their original and pieced together LeBron jerseys. Although Cleveland’s head coach David Blatt was unable to be reached for a comment, a source told The Cucumber that Blatt is quite confused as to who Drake actually is. “Coach Blatt has absolutely no clue who Drake is or why everyone is so excited.” Other than bringing a few more twenty-something idiots to the Cavs games, Drizzy’s spokespeople have said he’s excited to bring a little more “swag” to Cleveland. While many Clevelanders await Drake’s first ever Cavs’ and Browns’ games this year, even more await the opportunity to make fun of how hopelessly pathetic the artists’ bandwagoning mentality is. From sports fans everywhere, please, go away Drake…..please.